PFW11114 measures 11" x 14" and include an imprinted Suffocation Warning message in English, Spanish, and French. Ideal for packaging plush toys, clothing, and more. 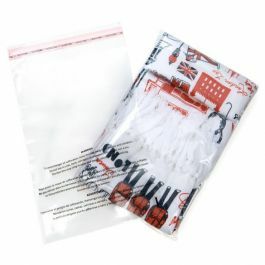 These self-sealing bags feature the highest standard for clarity available on the market and are 1.5 mil in thickness. Complaint for Amazon's FBA services. Our PFW11114 product is our 11" x 14" clear poly bag with a pre-printed Suffocation Warning in three languages. Message is placed in a prominent location and in a legible font to remind customers of the potential dangers that plastic bags pose to children. 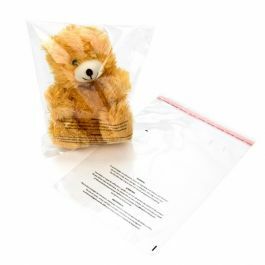 These bags provide the highest available clarity and feature an anti-static adhesive that makes packaging a breeze. Package plush toys, fabric, clothing, instruction manuals. electronic products, and more. 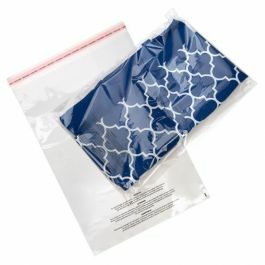 Adhesive is located on the bag flap and can be customized to fit your unique product size. Inner Dimensions: 11" x 14"
Most popular use is for packaging children's products and clothing.